* The Saints' pass rush was the dominant feature of this game tallying 6 sacks, ten QB hits, and numerous pressures. Bears' QB Jay Cutler was consistently harassed and battered by the relentless Saints' pass rush, as the Saints' blitzed six or more pass rushers on 40% of Chicago's passing attempts. 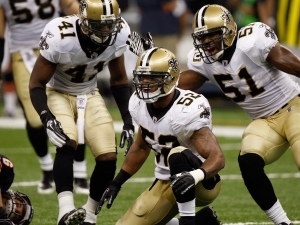 The Saints' 6 sacks represent their single-game high since 2008. Turk McBride's strip-sack in the 3rd quarter, and the ensuing fumble recovery by Jonathan Vilma, was the turning point in the game. The Saints soon converted the turnover into a TD and were then mostly dominant for the remainder of the contest. Second-year DE Junior Galette had a particularly excellent game, recording 2 sacks, 3 QB hits, and 2 tackles for losses. Galette's emergence as a situational pass-rusher is a promising sign for the Saints' defense, as he increasingly works his way into Gregg Williams' weekly game plans. Since coming to the Saints as a free agent in 2010, Galette has been lauded for his speed, athleticism, and raw skills; yesterday's performance was the first true glimpse of his development over the past fifteen months. OLB Jonathan Casillas recorded a sack for the second straight game and again flashed his trademark speed, bursting through the line to sack Cutler early in the fourth quarter. Casillas' chief role as a blitzing LB should soon lead into a full-time role as the season develops. With Casillas and Galette on the field, the speed of the Saints' front seven is noticeably improved. Finally, Roman Harper deserves mention for an outstanding performance. Coming into the game with a nagging ankle injury, Harper recorded 2 sacks. In general, Harper wreaked havoc all over the field and set the tone for the Saints' physical dominance on the day. While this might be a bit of an overstatement, it seems like the Saints' defensive fortunes swing with the performance of Harper so it will be incumbent on Gregg Williams to continually put Harper in the right spots to remain impactful instead of exploitable. * Jimmy Graham continues to look like the most physically-dominant player on the field in each game he plays. Graham caught 6 passes on 7 targets for 79 yards (the lone miss came on an errant pass Brees directed at Graham in the endzone in the first quarter). The Bears were continually befuddled in defending Graham, as Graham converted two key third downs and physically battered the Bears' defenders in his wake. Graham's leaping 31-yard reception in the second quarter fully-displayed the range of Graham's sublime talent, as he sped down the middle of the field, out-jumped safety Brandon Merriweather and effortlessly snagged Brees' high-arching throw as Merriweather harmlessly bounced off of Graham. What's more is that Graham--by all accounts reserved and humble off the field--brings a much-needed swagger and attitude to the field, reminiscent of former Saints' TE Jeremy Shockey. Graham's continued ascension and performances should be quite a sight to behold this season. * Let's give Thomas Morstead his due. Morstead did a masterful job of neutralizing Devin Hester, the Bears' most dangerous scoring threat, on both punt and kick returns. Morstead punted five times for a 45.8 yard average; four of Morstead's seven kickoffs went for touchbacks. Most importantly, Morstead allowed Hester to return just one in five punts, that return totaling -4 yards. Morstead has quietly been one of the league's best punters since his rookie season in 2009, fully justifying the Saints' decision to trade up into the 5th round of the 2009 draft to select him. * While it's difficult to complain about the defensive performance, the tackling remains inconsistent for stretches and the Saints' inability to corral Matt Forte proved troublesome all day. Credit Forte for his abilities and excellent performance for the game, but the Saints were continually unable to bring down Forte on first contact. To wit, Forte averaged 8.3 yards/touch. The inconsistent tackling might be a function of Saint defenders trying to strip the ball, but it's an area that can use improvement in the coming weeks. * I mostly make a concerted effort to not criticize the offensive play-calling because, well, I'm not a football coach. And Sean Payton is one of the best two or three best football coaches alive. But still, on two consecutive drives midway through the fourth quarter with the Saints holding a 17-point lead, Payton called five passes in six plays. The Saints' inability to complete these passes and convert first downs stopped the clock and continued to provide faint hope for the Bears' flickering chances. It seemed like this was the ideal opportunity to feed Mark Ingram and kill the clock, yet Payton demurred. * Once again red zone efficiency, and the Saints' corresponding inability to generate short yardage conversions, remains a troublesome trend. A week after a miserable performance in the red zone against the Packers, the Saints struggled again in the red zone and have scored just three TDs in nine total red zone attempts this year. In the first quarter, the Saints failed to convert a 3rd and 1 from the Bears' 13-yard line and settled for a FG. In the second quarter, the Saints again failed to convert a 3rd and 1 from the Bears' 9 and settled for another FG. Then again in the second quarter, on the cusp of the Bears' red zone, the Saints couldn't convert 2nd and 1 and ultimately kicked a long FG. On a positive note, the Saints did convert their two second-half red zone opportunities into TDs, so perhaps the improvement in this area has already begun.